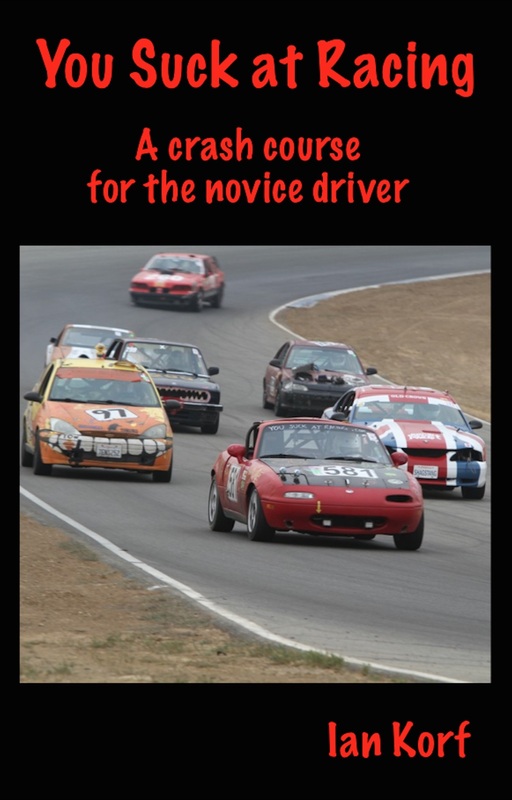 This page provides a ranking system to measure your driving skill. You may find this useful to track your improvement over time (or not). Hopefully you find it entertaining if not informative. Before getting to the ranking system, let’s appreciate how racing skill is distributed among the population. Lime Rock Park is a simple 7 turn track that is easy to learn and difficult to master. Because it is one of the free tracks in iRacing, and part of the Rookie racing series, it is very well known by all iRacing drivers. Here’s a plot showing the qualifying times at Lime Rock in the MX-5 series in iRacing (2015 S1 W3). If these times look slow, that’s because this was back when the series used the NC MX-5 and the current ND MX-5 is a second faster. 1315 drivers did qualifying sessions. Many people race without qualifying, especially rookies, so this plot is skewed towards people who are more serious about racing. And, of course, this plot doesn’t include the people with no interest in racing. The shape of the curve is not exactly a bell curve. There’s an upper limit to how fast one can drive, but no lower limit. What’s interesting about this is that driver skill has such a large range of variation even among enthusiasts. Only 20 people went faster than 60 seconds. This top ~1% of drivers are colloquially referred to as aliens because they don’t appear to be human. The median time is 1:01.682 while the average is 1:01.953 with a standard deviation of 1.464. Lately, I’ve been preferring Brands Hatch Indy to Lime Rock Park. The reason is that Brands Hatch can be found in more simulators. I also prefer the NA Miata because when people say Miata Is Always The Answer, I believe they are referring to the NA or NB Miata, not NC or ND. Here’s what how the lap times are distributed in Assetto Corsa at the RSR LiveTiming site. Again, I think this data is skewed to the more serious racer as the more casual drivers don’t bother with the plug-in that records and uploads lap times. As you can see, it has a similar shape to the graph above. There is a wide range of driving ability even in the virtual world where we can hold things constant. With inspiration from the National Tennis Ranking Program (NTRP), I present a driver ranking system that describes various levels of driving skill. In addition to the numerical rating, I’ve also added a descriptive label and some explanatory text. Level 1: Commuters. Drivers at this level drive mostly because they have to, not because they enjoy it. Their favorite part of driving is probably listening to music. When choosing a car, they may prioritize status, comfort, fashion, utility, or economy depending on their personality. On the street, these drivers tend to be safe except when distracted by things going on inside the car, like texting. On a race track, these drivers have no conception of the driving line and are so focused on the track ahead that they don’t look in their mirrors. Level 2: Enthusiasts. These drivers love their cars and the experience of driving them. Enthusiasts gravitate towards sports cars and can quote performance metrics and engine specs from memory. Looking fast can be even more important than going fast, which is why their cars may have aftermarket spoilers, excessive camber, lowered suspension, and custom paint jobs. On a race track, these drivers follow the driving line, albeit at low G-forces. 2.5 level drivers begin to slide their tires and may become fascinated with drifting. On the street, these are the most dangerous drivers because they think the street is their playground. Level 3: Track Junkies. Drivers at this level love to go to track and autocross events. Their cars are set up for actual performance rather than just the appearance of it. 3.0 drivers are learning how to put advanced techniques such as heel-toe shifting, trail-braking, and left-foot braking to practical use. They also begin to experiment with tuning. Wheel-to-wheel racing experience is limited, however, and they may be dangerous in high-traffic or wet weather. 3.5 drivers begin to attack the track and may aggressively slide their tires, though often not optimally. Level 4: Club Racer: 4.0 drivers often have their own purpose-built racecar which they bring to local competitions. They have learned most advanced driving techniques and understand how to tune their car to optimize handling. Lap times generally fall within the same second or two, but they still make frequent minor errors which they may be unaware of. When trying to improve their driving, they tend to focus on the physical rather than mental side. In a regional race, they run a few seconds off pace in the middle of the pack. 4.5 drivers are more consistent (all laps within the same second) and may find themselves on a podium from time to time. Level 5: Semi-Pro. Racing is an obsessive hobby, but not a full time job. 5.0 drivers compete regionally and are a consistent podium threat. 5.0 drivers adapt their driving style to take advantage of their opponents’ weaknesses and drive fast in wet conditions or heavy traffic. Lap times are consistent and less than 1 second off the track record for their car. 5.5 drivers are a threat to win every regional race and they may also compete on the national level. They may own a lap record in their favored class. Level 6-7: Professional. 6.0 drivers are well-known on the national level and are paid to race as a full time occupation. 7.0 drivers have an international reputation and several sponsors with deep pockets. My RDRS is about 4.0-4.5. My lap times are pretty consistent and not really improving much anymore. I heel-toe shift well enough but I haven’t learned left-foot braking at all. I think my main strength is trail-braking, and I’m pretty good in traffic. I don’t have much driving experience on wet tracks but when I have done it, I’ve been better than most. My lap times generally fall within the same second. In virtual racing I’m pretty fast, but not quite an alien. 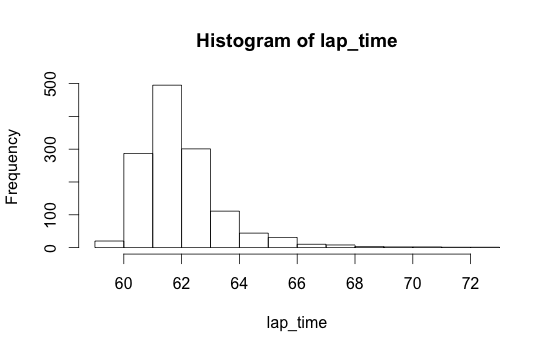 Where did you get the data for that iRacing histogram? I’d love to be able to pull numbers like that to see how I’m going as I start learning sim racing. Go to the Series stats page and export qualifying times as CSV. Make sure you have all divisions selected. Qualifying is no longer a separate activity, but you can get the same kind of data from Time Attack.